iPRM is a targeted proteomic method that combines the specificity of mass spectrometry with the throughput of an immunoassay. It provides absolute quantitation of low-level proteins and post-translational modifications. It’s also a multiplexed technique, so you’ll get more data with a single experiment. iPRM assays use best-in-class CST antibodies and are developed and validated by our expert scientists, so you’ll get data you can trust, fast. TMT10plex™ Total Proteome profiling service provides accurate global profiling of protein abundance in cells and tissues, using multiplexed sample labeling with Tandem Mass Tags™ (TMT™) and liquid chromatography tandem mass spectrometry (LC-MS/MS). PTMScan® Discovery is used to identify and quantify hundreds to thousands of PTM peptides. IMAC captures negatively charged phosphopeptides using positively charged metal ions and is complementary to phosphorylation analysis by PTMScan® Discovery. PTMScan® Direct is a mass-spectrometry-based antibody array used to quantitatively assay the activity of components of known signaling pathways across cell lines or treatments. KinomeView® Profiling is a western blot prescreen that uses the same PTM and motif antibodies available for PTMScan Discovery. Quantification of protein levels across cell lines or treatments without enrichment for PTM-containing peptides. Mapping of PTMScan results onto canonical pathways and new interaction networks using Qiagen’s Ingenuity® Pathway Analysis (IPA) software. Before sample preparation for PTMScan® Discovery, KinomeView®, or PTMScan® Direct Services, please download and review the PTMScan or KinomeView Sample Preparation Protocols. 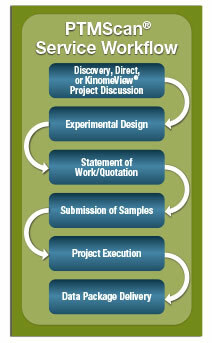 * More accurate timelines for service projects with greater than 42 samples will be discussed during the consultation. NOTE: Estimated timelines are based on when the project is initiated by Cell Signaling Technology, not when the material is received from the client.